What’s The Difference Between Paleo and Keto? Paleo and Keto are two buzz words associated with rapid fat loss and healthier lifestyles. Both diets have overlapping foods and benefits, but what are the differences? Let’s take a look at these questions, so that you can decide which diet (or maybe combination of the two?) works best for your lifestyle. The Paleo diet was born through the observation of hunter-gatherer tribes; communities that did not suffer from the modern degenerative diseases that plague us today. Without modern medicine these tribes suffered from higher rates of infectious disease, injury and childbirth complications, but they rarely experienced heart disease, obesity, or type 2 diabetes. The Paleo diet is primarily anti-inflammatory; it is naturally low in carbohydrates, high in omega-3s and low in omega-6s which makes it very effective for reducing inflammation. This diet consists of grass-fed meats, wild seafood and shellfish, fruits and vegetables, and nuts and seeds. The Keto diet was originally used to prevent and reduce seizures in epileptic patients. It was born out of the need for epilepsy treatment in the early 1900’s, when there were no medications available. 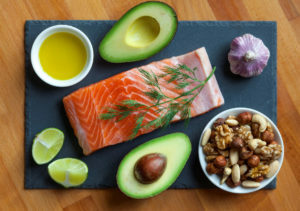 Since its discovery, research has found the Keto diet to be extremely effective for fat loss, for endurance performance, and as a therapy for medical conditions such as type 2 diabetes, cancer and Alzheimer’s disease, among others. Ketosis evolved as a way to help early humans survive during times of famine. It is the state your body enters into when glucose is not readily available for energy, so your body burns fatty acids instead, which produce ketones, an alternative energy source. To learn more about “going keto” check out our recent blog post, Are You Ready To “Go Keto”? You should aim to get around 70% of your energy from fat, less than 25% from protein and less than 5% from carbs. It’s possible to go in and out of ketosis while following a Paleo diet, all you need to do is track your macros! By following the Keto macronutrient ratios, you can achieve a low carb, high fat version of the Paleo diet that is highly effective for fat loss. Or you can add back in some Paleo-friendly carbs and toggle back into a less restrictive Paleo diet, while enjoying the health benefits. To learn more about the nutritional programs we offer at Fitness Transform, request a free consultation today!